Sure facelifts have been around for over one hundred years, but many people want to avoid the invasiveness and recovery required with a facelift. 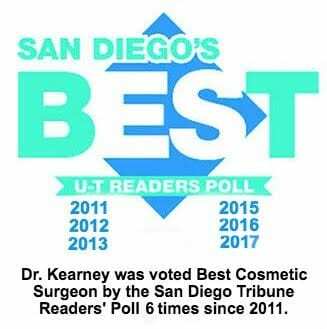 For those patients, Dr. Kearney has added FaceTite, an advanced contouring and skin tightening system that provides surgical-type results without the surgery. FaceTite tightens the skin on the face and neck. FaceTite uses radiofrequency assisted lipolysis technology to tighten the skin. It delivers radiofrequency energy into the dermis, the skin’s second layer. That energy converts to heat and causes the skin and subcutaneous tissue to contract. As noted above, FaceTite uses RF energy to trigger a tightening response in the skin. During a FaceTite session, Dr. Kearney first administers a local anesthetic to the treatment area. Then he inserts a small cannula beneath the skin surface. This is connected to an external electrode that rests on the skin surface. A highly controlled thermal field is then delivered into the dermis through rapid, uniform heating. This heating has two effects: it liquefies some of the fat and “shrink wraps” the tissue above. What are the benefits of FaceTite? Where can FaceTite be used and when will results show themselves? Dr. Kearney uses FaceTite on areas of the face and neck with saggy skin. These include the jowl line, double chin area, lower cheeks, areas around the mouth, and more. Results take time, as the body tightens the skin structure. The most noticeable results show themselves in three to six months. The contraction of the outer skin can last for a year or more. Are you interested in the results of a mini facelift without the actual surgery? Call Dr. Kearney at 858-677-9352 and ask about FaceTite. How Well Do You Know Your Injectables?